After I start the Visualizer and open any existing .lee file, it opens correctly and I can edit and do whatever I need to. 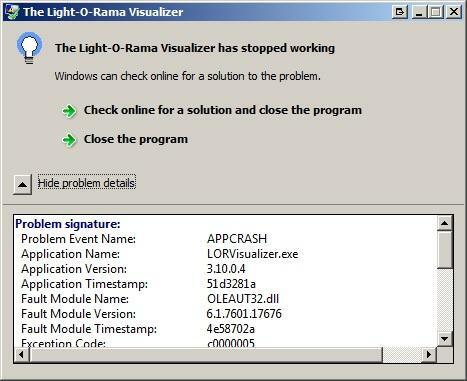 But when I'm finished and exit the app, the dialog box opens that says "The Light-O-Rama Visualizer has stopped working". This is not a show stopper, but an annoyance. Here is the information from the problem details. Repeatability: I can easily repeat this problem by simply closing the Visualizer and reopening it and any .lee file and then close the Visualizer. The dialog box will pop-up. To see if my system may be at fault, I opened a clean Windows 7 virtual and installed 3.10.4 and went through the same steps as above. I also got the same error on the virtual machine. Crashes in Oleaut(32/64) are usually caused by a problem within windows iteself. Ensure you have all the latest updates installed on that computer. The problem can also manifest itself due to Virus Scanners. You can try to turn off your AV and see if the problem stops. If so, the problem is there. In any case, be sure to turn your AV back on again after. I installed LOR 3.10.0.4 onto a fresh install of Windows 7 x64, and fully patched. I did not install any antivirus software. And I'm still getting the same error each time I close it.